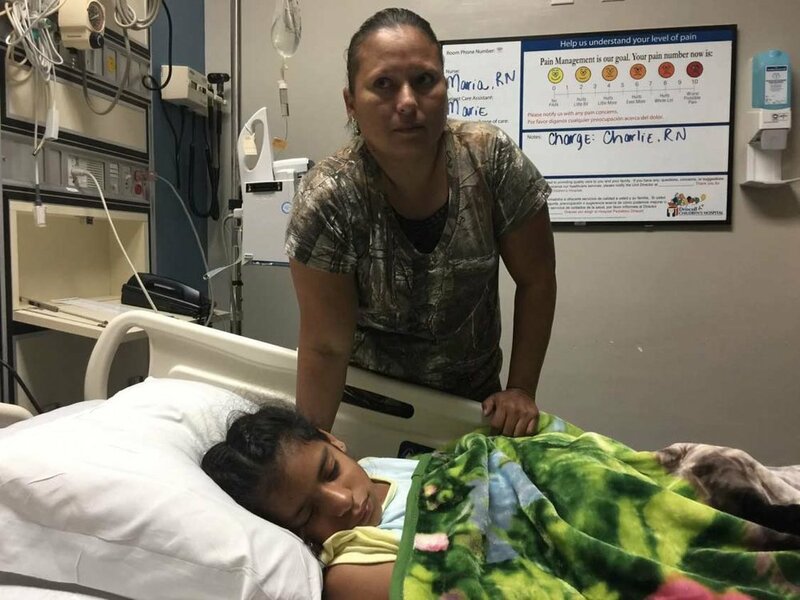 In October, Rosa Maria Hernandez, a child of undocumented immigrants, was taken into custody by the US Border Patrol as she was transported through a checkpoint on her way to a Corpus Christi hospital for emergency surgery. Rosa, who has cerebral palsy, was then transported to a shelter in San Antonio where she was held for ten days. In the days following her detention, many groups and organizations protested these actions by the US government. A number of retired and active Rio Texas Clergy, along with other pastors and lay people have issued a statement in response. The statement began circulating among Hispanic/Latino clergy prior to the release of Rosa Maria Hernandez, Friday, November 3 when she was reunited with her family in Laredo, Texas. First United Methodist Church: Del Rio and Principe de Paz UMC have joined forces along with 13 other local churches to reach out and assist those in need. Shipments of nonperishable food and health essential kits have arrived from UMCOR and will be distributed very soon to refugees that will be released and who will be traveling on buses from our area. The churches have received two shipments thus far of this humanitarian aid. They are expecting a larger third shipment which will be to be delivered to Principe De Paz United Methodist Church on Monday, April 15. Inspired by a guest lecture on ‘Border Stories’ by Bishop Robert Schnase at Texas State last fall, a group of students from the United Campus Ministry at Texas State spent their spring break in Eagle Pass with Mission: Border Hope. Students of the United Campus Ministry at Texas State prepared ashes from last year’s palms through a prayerful liturgy. They practiced creating and filtering the ashes to be ready for Ash Wednesday worship. I intentionally write this BEFORE any final plan decisions are made. You would have known the outcome of GC2019 long before reading this. More importantly, looking back at GC2019 (Praying Our Way Forward) and arguing its merits, regardless of its outcome, is now of lesser importance than “discerning a way forward” for our churches. In recent days, I find myself reflecting on past experiences and wondering about the future. I know I’m not alone in my thinking back and looking ahead. Here I join the many different people from many different places who are sharing their thoughts and hopes. I will meet some of you face to face in St. Louis. Others of you can meet me right here in this blog where I will share a few of my reflections over the next few weeks. At Annual Conference this June 5-8, we will elect delegates to the 2020 General & Jurisdictional Conferences. Clergy interested in serving as delegates are invited to submit this form available to indicate their interest. All clergy members in full connection (Full Elders and Full Deacons, including those approved for ordination at this year’s Clergy Session), whether or not they declare their interest to serve or furnish information on this form are eligible for election (¶35 Article IV, 2016 Discipline). The Master’s degree is offered through a unique intensive-based curriculum format in partnership with Austin Presbyterian Theological Seminary. We are currently accepting applications from the first 12 churches to apply for partner churches for our Texas Regional Campus. Applications will be accepted through March 31st space permitting. Dallas, Texas: The General Conference Committee on Reference has determined that 78 petitions submitted for consideration by the 2019 General Conference are in harmony with the purpose of the special session to be held February 23-26, 2019 in St. Louis, Missouri. The Rio Texas Conference of the United Methodist Church hosted the first Texas Planters Gathering, where pastors from all parts of Texas learned what's possible in church planting. Join us next year in Houston on October 25-26, 2019. Through support funding from Methodist Healthcare Ministries of South Texas, Inc., The Mission Vitality Center / Outreach Vitality Office & Transforming Communities Vision Team announces the Transformational Communities of Praxis program. Applications are now being received for the 2nd- year class of this program. The program is looking for church and community resident teams to participate in this program of learning processes in Asset-Based Community Development [ABCD]. Class size is limited to four teams. Sixteen members of the Rio Texas General and Jurisdictional Conference Delegation attended the South Central Jurisdictional General Conference Delegate Gathering held at St. Luke’s UMC in Oklahoma City on October 4-5. The gathering, hosted by the SCJ Mission Council, was held to inform the delegates of the three structure options to be presented at the 2019 Special Session of General Conference. The pension implications of each plan were also presented. Delegates from across the jurisdiction joined in a time of listening, learning, worship, prayer, sharing, and developing a sense of community and understanding across different backgrounds and beliefs. The event planners purposefully assigned seating to create a mixed group from different delegations and beliefs at each table, which allowed for a new depth of conversation surrounding the UMC and our mission and purpose. We discussed how that depth applies to the decisions to be made at the General Conference Special Session next February in St. Louis.